After speeches by Kirk Ramsay, Chief Executive of Glasgow Science Centre, and Judith Masthoff, children had a first go at using the Joking Computer. Judith, Kirk and two children from Tobermory primary school were interviewed for BBC Radio. Graeme, Kirk and two other children from this primary school were filmed. 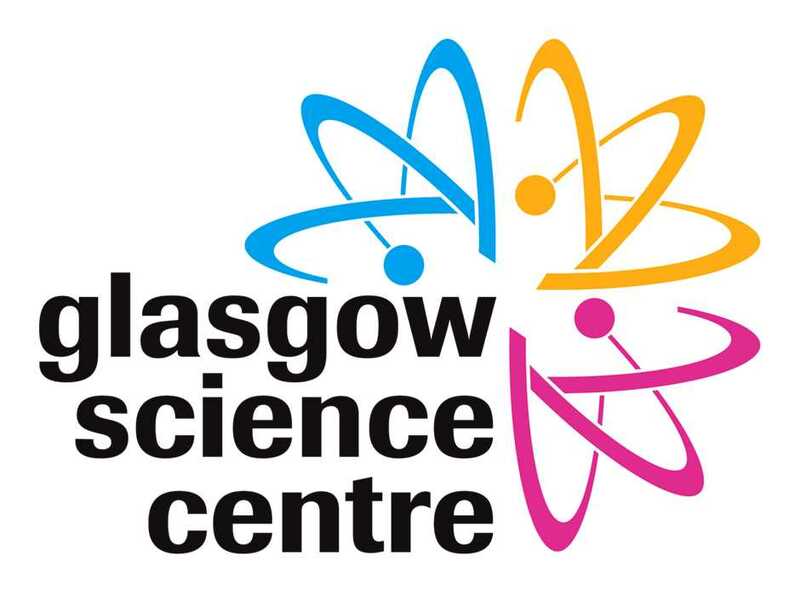 The Joking Computer has now left the Glasgow Science Centre (but there are lots of other exciting exhibits to see there). Where: Satrosphere, Aberdeen, as part National Science and Engineering Week. The Joking Computer is now also in Satrosphere (Aberdeen's Science Centre)! 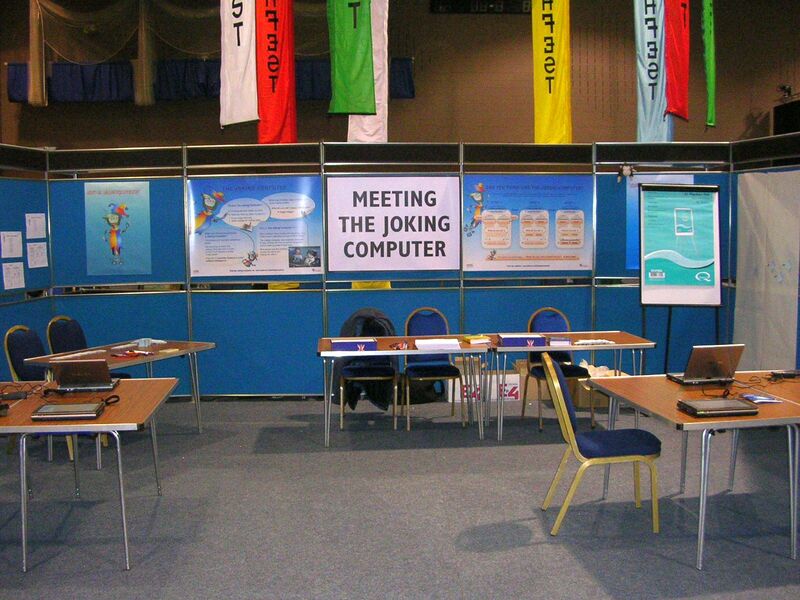 On this day, Graeme and Judith were present to interact with visitors to Satrosphere and answer questions about the Joking Computer. The Joking Computer is staying in Satrosphere for now. Come and visit! Where: King's College, University of Aberdeen, as part of the Word Festival. We started with a short introduction of the Joking Computer and why we are building one. Next, children made their own jokes, using paper sheets that follow some of the recipes the Joking Computer uses (see example recipe in the picture on the left). They also spent some time playing with the Joking Computer itself. Prizes were awarded for the best jokes produced by the children. Example of a winning joke: "What do you get when you cross a dragon with a drink? A wine-osaur." These workshops were attended by 55 children from P5 and six adults, from two Aberdeen primary schools. Material from the workshops is available to use without charge for educational purposes, see this powerpoint file. 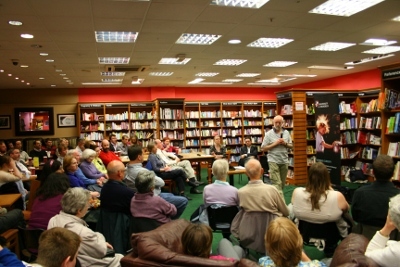 Where: Waterstone’s Bookshop, Union Bridge, Aberdeen, as part of Cafe Scientifique and the Word Festival. Graeme introduced the ideas behind research into humour, and outlined some of the ways that humour is created using language, illustrated by audio recordings of jokes in various languages. The audience had the chance to make their own punning riddles on paper, and the resulting jokes were read out. Afterwards, there was a lively question session. This event attracted around 120 people, almost all adults. 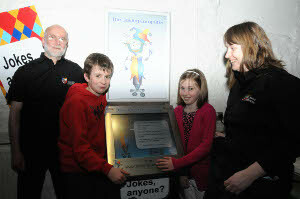 Over a hundred people, adults and children, came to explore the Joking Computer software and make their own jokes on paper. See some of these jokes. Where: Satrosphere, Aberdeen, as part of Science in the City. 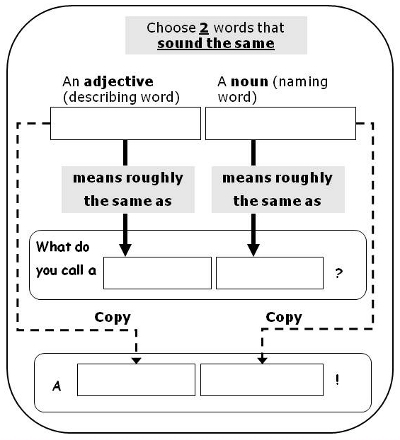 Children used the Joking Computer software, and also made up jokes on paper. This event involved about 10 children and their parents.